You are playing World of Tanks and you notice your network indicator in game is flashing red, or you disconnect in the middle of a battle, why is this? Latency - the time it takes for a network packet to reach the destination address and return to the sender. The minimum theoretical latency for a connection across the internet is based on the distance and the speed of light. Latency will increase if there are problems in the transmission medium or errors in the switching and routing. Latency is measured in milliseconds. Packet loss - Network components will drop network packets when they are overloaded, meaning they will not sent the packets to the next hop in the route. The first packets to be dropped are those with the lowest priority. This is the prime cause of packet loss or lag. Packet loss is expressed as a percentage, so when 100% of packets are being dropped then your connection to the endpoint will cease if it continues for a few seconds. When you connect to a location on the internet your Internet Service Provider (ISP) sends your traffic across their network and at some point they have to connect to one or more other carriers networks to reach the destination, this is known as the route. Each hop in the route is where the traffic leaves one network address space to get to another and the change in network is managed by a router. Routing decisions are typically done automatically based on optimising the number of network hops, however this can also be affected by the commercial agreements your ISP has with the other carriers. ISPs that have a direct commercial agreement or relationship with an international carrier typically get higher priority and therefore are less likely to be affected by packet loss, at least up to the point that the international carrier hands off to the local ISP of the destination address. Conversely ISPs that have no commercial agreement or pay the lowest rates will therefore get the lowest priority and be the first to be dropped. So, what can you do? Before you make any decisions you need to see where the issue might be. For this I use a tool called pingplotter that has a free version that can be downloaded from https://www.pingplotter.com/products/free.html. With this installed use the following name for the HK server wotasia2.login.wargaming.net, or wotasia3.login.wargaming.net for the ANZ server. If you have latency on the first line (your router) that is above a few ms or packet loss then restart your router, as this is showing it is overloaded. If packet loss on a network node that is at 100% is showing this is not necessarily a sign of actual traffic packet loss, it is most likely that the router is configured to ignore ICMP packets which is what ping uses. If there is a reasonable amount of packet loss however on any hop up to the last one then contact your ISP with the information, you will most likely have to escalate past the first line of support as they work of scripted answers. Restarting your router may also have an effect here is it may allow a new route to be selected in some circumstances. If the packet loss is happening at the last hop, this is WG's ISP and you should raise a ticket with Customer Support with your evidence. 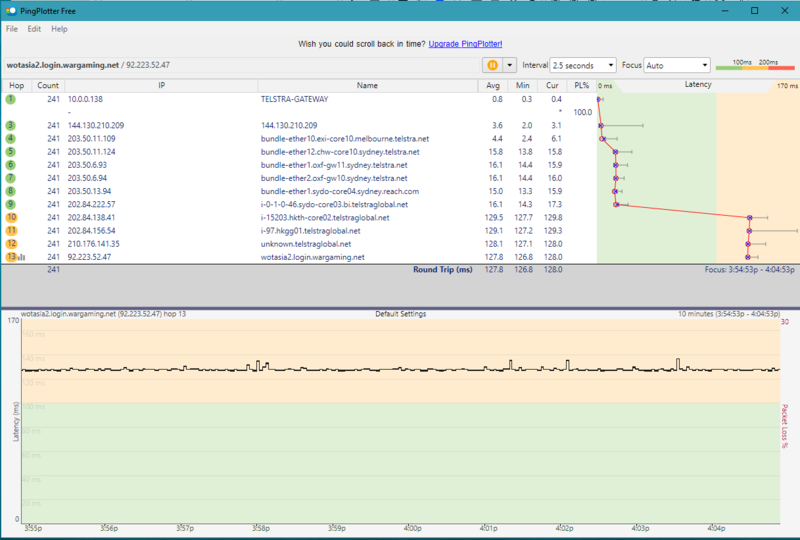 If none of the hops are showing packet loss or abnormal latency then the issue is in game, and again you should raise a ticket with Customer Support with your evidence. https://asia.wargaming.net/support/en/products/wot/article/21775/ - I am having frequent lags and disconnection while playing the game, what to do? https://asia.wargaming.net/support/en/products/wot/article/21777/ - What is a ping plotter file? How do I send one? What the hell, this looks like witchcraft to me. I just want to log in and play some tanks, yeah I got 120-200 ping to Singapore, now I get 300 ping and HUGE lag stutters IN BATTLES on a good day (when school is in session) and just tried now school is out and getting 350-400 ping IN BATTLE. French tyre tanks completely unplayable, all game unplayable. Let me know when you fix it. Ping to Hong Kong server is normal until that last step, doesn't happen all the time, just every now and then for a while before disappearing again. When it does happen then lag spikes are normal. Needs to be looked into. Hate the wheelies, remove them. If you read the article then you should know that you should be contacting WG via the Player Support link above. Did the contact Support bit, it was good and would find a lot of issues. But not mine. 75 Ping to Singapore (fine) then another 75 to HK and into the sever (not fine). This bit should be 30 not 75. Doubt Telstra would give a rats. Tanitha use to sort these issues, where he go? high ping from server side. ticket raised, got a copy pasta reply implying problem was at my end when it clearly is not. Go through the whole thing, lots of steps. Might work. i have raised a ticket hope its fixed soon. hops in US, JPN and then reaches HK. Your ISP must be routing around a cable issue. You can ask them why that is happening. And the ping is back up again at the same point as last time. well i am using VPN to decrease ping to around 180ms, it kinda works with 1-2%PL. WOT Asia / Australasia Language Based Communities → English Speaking Community → Technical & Bug Reporting Section → High Ping for 4g LTE users in India.